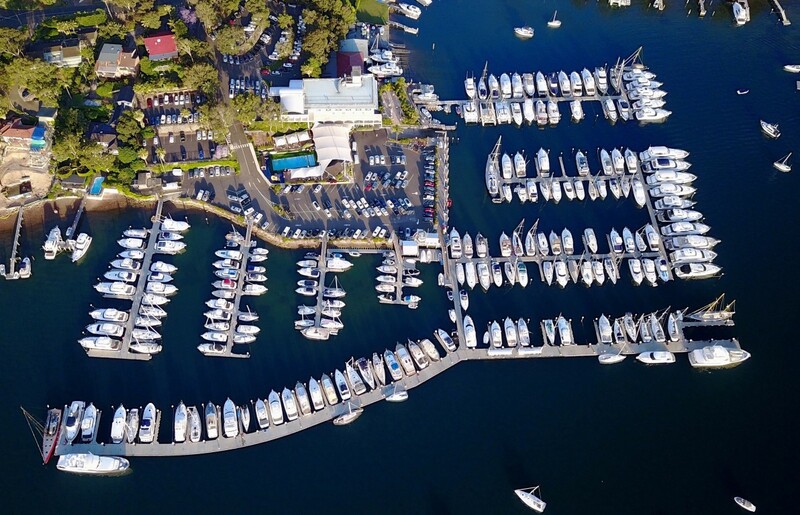 The Royal Motor Yacht Club Broken Bay, offers a world-class marina facility with permanent and casual berths available. The club provides secure safe parking for boat owner members and access to a range of services from fuel sales, on board catering and slipway facilities for vessels up to 100 tonnes. The club boasts 256 fixed berths of all sizes, 38 Swing Moorings and a 300mtr floating break-wall of 11 casual visitor berths. CLICK HERE for all the Marina Tours. Fuel is available on the western arm of the marina on the break-wall and adjoining the southern end of the carpark. Note: Only diesel is available on the (outside fuel wharf) western arm. Click here for Fuel wharf operating hours. We also have dinghies that are available for after-hours use for members. Bottled gas, crushed or block ice as well as bait are all available at the Royal Motor Yacht Club. Please ask the marina attendant for service and also availability of oil. The Royal Motor Yacht Club provides a pump out facility to both members and visitors of the club. The facility is free to members of the Royal Motor Yacht Club Broken Bay and with any fuel purchase. A pump out without a fuel service is at a cost of $20.00 for non-members. The club provides laundry facilities to our Marina Residents, including those with Casual Berths and Moorings. These facilities include: Washing machines & dryers which all located on the ground level of the club. Dinghy storage is available at the club. It is for members only & is on a per month basis. Please enquire at the Marina Office about availability. The Royal Motor Yacht Club’s boat ramp is located at the southern end of the driveway and is available to boat owner members of the Royal Motor Yacht Club. The club does have a slipway on site, which is run through one of the clubs on site services Newport Marine Services. For bookings or more information, contact Newport Marine Services on 9997 7702. For the convenience of members and casual visitors, the club has numerous trolleys available to assist in the transfer of your belongings from your vessel to your vehicles and vice versa. These facilities are accessible 24 hours a day for the use of club members and marina guests. The main bathrooms with the showers are located at the lower level of the club for your convenience. The Royal Motor Yacht Club has a work pontoon available to members with one night free per month. For more information on Membership, please phone Marina office on: 9997 5511. The club has a swimming pool located on the ground level, just outside of the restaurant. Use of the pool is for members & their guests of the club; however some exclusion does apply for casual berths & moorings. The pool is open between the hours of sunrise and sunset 7 days a week, with routine maintenance taking place occasionally mid-week. The pool is heated to 27 degrees all year round & is supervised in the summer months. The club has a Wi-Fi service which is available to members for free, as well as people on casual moorings or berths. For more information, please see Reception. Please Note: The Wi-Fi service reach is dependent on the vessel location. In addition to the Moorings located on site at the Royal Motor Yacht Club, the club provides it’s Boat Owner Members with access to 15 Club moorings located in the beautiful Pittwater & Hawkesbury waterways. These are for club Boat Owner Members only. Please see Reception for Maps & more information. (There are also club moorings at America Bay, Refuge Bay, Coasters Retreat and Patonga (Brisk Bay). Club Burgees are available from RMYC Reception. The Burgees are small and large, depending on size of your vessel. The Club Burgee advises other boaters on the water what Club you represent.